Journalist Leslie Stahl will also respond to “Lolly.” Actress Susan Sarandon goes by “Honey.” And Grandpa Martin Sheen answers to “Peach.” The cute names we come up with to call our grandparents are pretty much infinite, but still we thought it would be fun to take a sampling. If you’re going to be a Grandma or Grandpa soon, or if you’re just curious, read on to learn what some Hallmark fans call their grandpeople and how those nicknames came about. I called my grandfather on my dad’s side Gran Gran. I was my Gran Gran’s only grandchild, so I’m sure that name came from me trying to say grandpa. My grandfather was called Pop-O long before I was born, so naturally I called my grandmother Mom-O, although no one else did. My mother’s parents were Mama and Brownie. Mama is what my mother called her mother, so everyone else called her that as well. One of my cousins gave my grandfather the name Brownie because he always wore brown pants for his job. When my cousin was about two years old, he called him Brownie one day and it stuck. With my kids, my mother is called Grandma, and my mother-in-law and stepmom are both known as Mimi. They all picked what they wanted to be called. My dad and father-in-law are both called Pop-Pop. I watched the TV show “Arrested Development” a lot while I was pregnant with my daughter, and I remembered George Sr. being called that. I just liked how it sounded. My mom named me after a TV character, so in a way, it was a tradition coming full circle. I’m Taiwanese/Chinese. 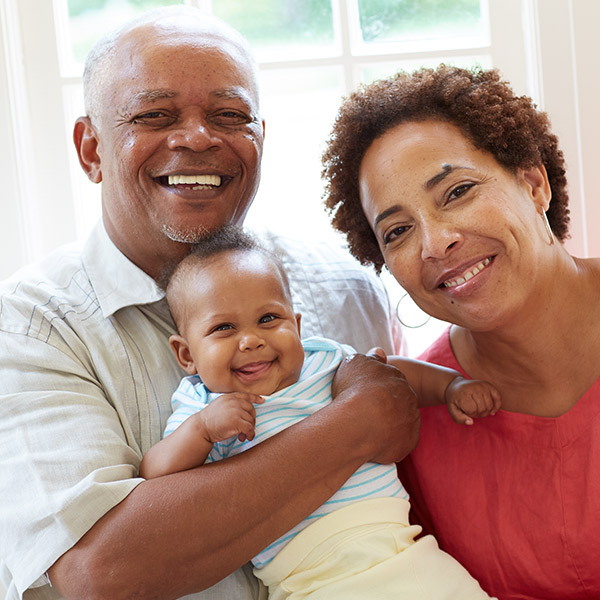 There are specific names for maternal versus paternal grandparents. I call my maternal grandmother Wàipó, my maternal grandfather Wàigōng, my paternal grandfather Gōnggōng and my paternal grandmother Nǎinai. My children call my mom Apó and my father Agōng. We use “a” instead of “wài” so that there is a distinction between what I call my grandparents and what my children call my parents. My grandmothers were Tita and my grandfathers, Tito. These nicknames originated from the Spanish words for grandmother and grandfather, which are “abuelita” and “abuelito” respectively. As kids try to pronounce these words in Spanish, the tita and tito abbreviations would naturally come out and eventually became the nicknames. This is certainly a cultural tradition that is here to stay. We still call them those same nicknames even as adults. I called my grandparents Nannie and Gunts. They wanted me to say Gramps, but it came out Gunts and stuck. My mom and dad are Nannie and PawPaw to our kids. They called my grandma Gigi and my Nannie G-Nannie. Both of my grandpas were Papaw. My maternal grandma was Nanny and my paternal grandma was Mamie. My sister was the firstborn, so she got to name them. There’s not really any cultural significance—just what her toddler brain came up with! My kids call my parents Nonni and Papa, which is what my nephew (again the firstborn) landed on, despite their attempts to have him call them Gramps and Gran. We called my paternal grandmother Grandma. My children call my father Booboo, my husband’s father Pawpaw and his wife G.G. Booboo came from him calling the kids Booboo. They thought they were supposed to say “Hi Booboo!” and the name stuck. I call my grandpa Kung Kung or Yeh Yeh, and grandma Porpors or Mahmah. My child does the same. We grew up calling our grandmother Granny. Our grandfathers passed when we were young and my paternal grandmother passed when my father was a toddler, but I believe we called them Grandpa. My kids used to call their paternal grandmother Grammy (she recently passed); this is what she wanted to be called, and they call my father-in-law Papa. They’re from Texas. All of my grandparents were called either Grandmother or Grandaddy. We were not the first grandkids by a long shot, so I guess we went with whatever other family members called them. My kids, on the other hand, were the first grandkids for my parents. So they paved the way. My daughter started calling my mom Me-mommy when she couldn’t say Grandmommy. Fourteen years later, it is still going strong. My dad, on the other hand, is a little crazy and occasionally ridiculous and he got the kids to call him “Poobah” (from Gilbert and Sullivan) as they were growing up. That, too, has stuck. So we have a Me-mommy and a Poobah. On my dad’s side, we called my grandmother Granny and my grandfather Granddaddy. As far as I know, it was their choice on what we called them. I know we also called my great grandmother (Granny’s mom) Big Granny, even though she was smaller than my grandmother. On my mom’s side, we call my grandmother Nani, because she said she used to work with an Indian woman and that’s what her grandchildren called her. Funny, I went to school with a girl from Pakistan and when she heard me call my grandmother that, she was surprised and asked how I knew to call her that. Apparently it is the Hindi word for maternal grandmother, which I thought was super cool. I’ve never met my mom’s dad and we never called him anything. As far as my son is concerned, he calls my husband’s parents YeYe (grandmother) and Babawo (grandfather). They apparently looked up how to say grandmother and grandfather in different African languages. My mom got talked out of GlamMa (I couldn’t do it) and she decided to go with MiMi. My dad wants to be called Pop Pop (even though he hasn’t hit 60 yet, LOL). I called my great-grandmother Granny. I called my grandmother Grandma. My children call my mother Gram-me. They call my husband’s mom Mema. In my familia, we always called grandparents Grandparents, but with the birth of my nephew, all of this changed. When he began to say his first words, he said to my mother “totoy.” Since that day, we call her Totoy. I called my maternal grandparents Nana and Pop-Pop. I think this is what my mother called her grandparents as well. My daughter calls my parents Grammy and Pop-Pop. My mother did not want to be called Grandma or Grandmother, so we taught our daughter to call her Grammy. My dad chose Pop-Pop because he was close to my mom’s dad. My husband’s parents are Nonna and Papa, from the Italian culture. Being of Indian origin, we called both sets of grandparents Dada, which means grandfather, and Dadi, which means grandmother. Though both my kids call their maternal grandparents Nana, which means grandpa, and Nani, which means grandma. Their paternal grandparents are called Dada and Dadi. Whenever we meet any elderly people, my toddlers address them as Nana and Nani. My boys call my husband’s mother Ma Pita. She does not like “abuela,” the formal name for grandmother in Spanish. I call my maternal grandmother Grandma. I call my paternal grandmother Lucha and my maternal grandfather Abuelito. I call my one grandmother Lucha because that is her nickname that everyone calls her and not Abuelita (grandmother in Spanish) because that would make her feel old. I call my grandfather Abuelito because that’s just how you say grandfather in Spanish. They are from Ecuador and only speak Spanish, so we call them by the Spanish names. My kids call my mom Grandma and my father Welo (short version of Abuelo, Spanish for grandfather). They call my husband’s mom Wela (short for Abuela) and his dad Pipo (my daughter just started calling him that one day when she was a baby and it stuck). My son calls his grandmothers Yaya and Grandma. My mother picked the name Yaya, which means grandma in Greek. She wanted something unique. I am Taiwanese-American, so I called my mother’s parents Amà and Agōng and my father’s parents Nǎinai and Yéye. As I married another Taiwanese-American, my kids call them the same names that I called mine out of tradition and respect. I had a granny who was always called Granny, even after I was an adult. My son calls his grandma Little G, his grandpa Big G and his great grandma Ting G. I have no idea why he started that, but they love it. I used to call my grandparents Nana and Tata. My kids call their grandparents Nana and Tata, and my grandkids call me Nana and my hubby Tata. So there’s no real story. It is just same as it has been for generations. We were never allowed to call my maternal grandparents Grandmother or Grandfather. Out of respect, we were taught to call them Mami Luz and Papi Felix. I had two sets of living grandparents when I was born. We called my father’s parents Busia (grandma) and Dzia Dzia (grandpa). Both sets of my grandparents were 100 percent Polish, and these are the polish names. We just called my other grandpa and grandma just that. It definitely made it easy to decipher between the two when we were speaking of them. My kids do not call their grandparents anything special. My mom doesn’t want to be called Busia and my kids just call my parents Grandma and Grandpa. They call my husband’s parents Grandma Janice and Grandpa Jim in order to decipher between their grandparents. I call my grandmother Ma and my grandfather Day. I really don’t know where it started. My child calls her grandparents Nana, Papa and Grandma. One grandmother was called Abuela and the other was called Madrina, since she was also my godmother. I only have one grandmother and she was the true matriarch of the family. She was called Mama by everyone. My children have two grandmothers, Nan and Abuela, and one grandfather called Pap. My grandparents from my mother’s side are from Germany. I called them Oma and Opa. I come from the south part of India. My grandpa was called Apoopa (father of mother) and grandma was called Amoomma (mother of mother). I have no idea why they were called that. I was taught to call them like that and that’s what I did. My kids call my parents the same names to keep up the tradition. I never met my grandparents on my father’s side, but they are called Achhachan and Achamma.